Mega Man X is separated into stages where the player must run from start to finish in a linear manner. At the end of each level a boss awaits Mega Man. 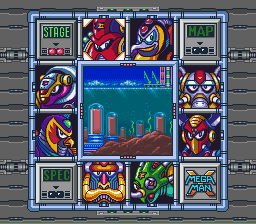 After beating the first stage, the player will have the option of selecting other stages, each of them with different layouts and enemies, as well as a boss (or "Maverick") at the end. These stages can be beaten in any order, but the order below is recommended. After beating the boss at the end of these stages, X will gain a new weapon; he can also get upgrades, heart tanks (which increases your maximum health), or sub-tanks (which contain energy that restores the player's health) in these stages. Once all of the bosses are beaten in their stages, the player will move on to the final part of the game: Sigma's fortress. The fortress contains four stages, each with a boss at the end. The final stage of Sigma's fortress contains the true final boss, and when beaten, will end the game. On each guide page, you'll find details about key difficulties and peculiarities of the level. Additionally, the level section and the boss section are kept separate. Also, after beating a stage, the player will receive a password which they can use to load their previous state. Note that loaded games will not have their extra lives or sub tank levels preserved. Simply select "Start Game" at the main menu to jump right in. For more details on this topic, see Mega Man X/Bosses. Criterion: The weapon obtained from each defeated Maverick is the weakness of the subsequent one. You have to re-visit four stages in order to collect all items. Criterion: collect all items and re-enter the minimum possible number of stages (i.e. just two). You have to fight two Mavericks (excluding the first one) with just the X-Buster. You get all the upgrades very early; the game will start more difficult, but end easier. The suggested order below allows you to defeat every Maverick with the weapon just obtained from the previous one, and also to minimize the number of re-visits to earlier stages. Chill Penguin Leg Upgrade. : need F. Mammoth's weapon. Spark Mandrill : need Leg Upgrade. : need B. Kuwanger's weapon. Armored Armadillo : no requirement. : no requirement. Hadou-Ken: need all weapons & items, visit 5 times. or Chill Penguin's weapon and the Arm Upgrade. This page has been accessed 825,381 times.